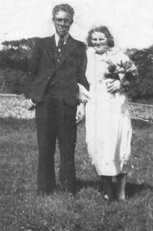 Ernest William Holder and Peggy King. 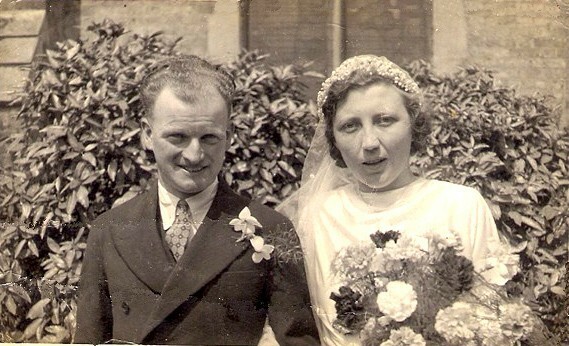 Married 25 April 1942. This page was added by Mel Allen on 12/05/2009. Hi Mel! I am a newcomer to Denton and am interested to find out all I can about the area. Can you tell me the whereabouts of the school in South Heighton? It's interesting to see the majority of the children in the photo holding something to do in their hands! From books to knitting and weaving in various stages of completion. Any more photos? Fascinating..I love it! The school building is now the Village Hall and is located at the bottom of The Hollow, the road which runs down from South Heighton to join the A26. 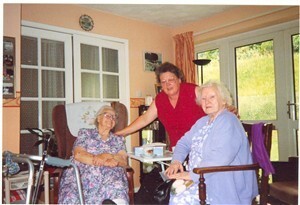 The Holder family had lived in the Newhaven, Denton & South Heighton area since the 1700's. 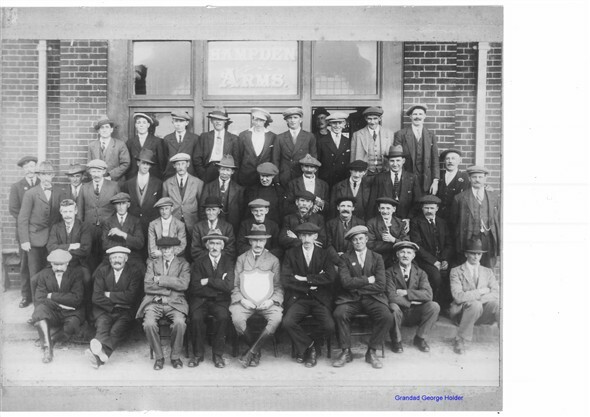 They first started working as carters on the Glynde Estate. They moved from South Heighton into Stock cottages which are located on the A26 just past the flint wall near the Railway crossing. My Grandfather moved into the Railway cottages when he started work for the Railway as a Ganger. His job involved checking the railway line by walking the track from his house to Southease then all the way back to Newhaven. He worked for the Railway company for 49 years during which time he only took one day off sick due to having developed a large boil on his shoulder where he carried his "keying hammer" which was used to knock in the wedges (known as keys) which hold the rail in place on the sleepers. Before the 2nd WW the family used water from a well situated near their house until it became unfit to drink and the Railway started transporting the water in Milk churns on the Locomotives that travelled past their house daily. 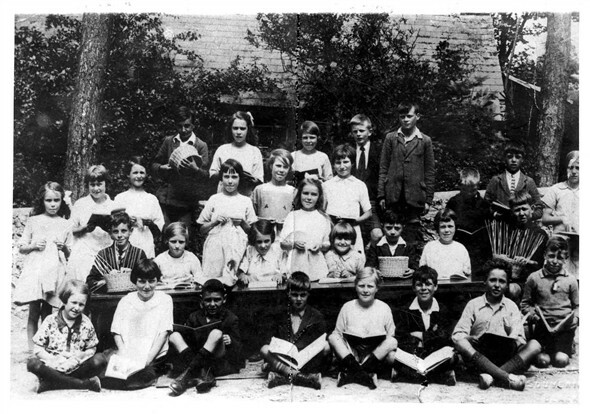 The majority of children attended South Heighton School during their early years before walking to Council Schools in Newhaven town. I was speaking to my mother the other day and she said that the groceries were delived to the house by Mr Bannister who owned the shop in Newhaven. Mr Mitchell delivered the Paraffin regularly. 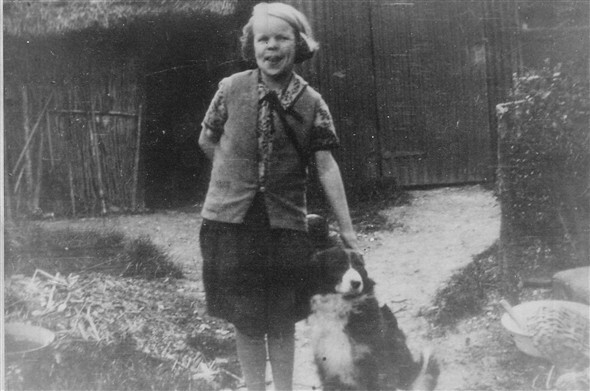 My Grandmother needed to go out one day and because Irene, her Daughter, wasn't very well and rarely left the house (Irene is the one with the dog in the Photo - dogs name was Bob), Grandma told Bob to look after Irene and not allow anyone into the house. Mr Mitchell arrived with the regular order of Paraffin and knocked on the door but Bob, snarling the whole time, wouldn't let him enter. Eventually he left and had to return another day. When you can actually speak to the senior members of the Newhaven family it's wonderful how they relate some factual and funny stories. The school photo obviously shows pupils with the results of their handicrafts. Is it possible that some are scrap books holding newspaper cuttings or other items of local interest, if so wouldn't it be nice to see these scrapbooks now with their historical memories? Is Ernest William Holder the father of Keith Holder - I went to school with Keith. He went onto Lewes Grammar, and later he worked for Bannisters Builders. The last time I saw him was when we were building the houses at the Guinness Trust housing site. I understand that Keith went to the US and has since died. I think he went to America as well. They lived in Beresford Road on the mount, we used to go to his house and play guitars and banjo. His father ( of the same name ) was an artist, I have two of his paintings. Sorry about Keith, he was a nice lad. I also went to school with Keith, in the juniors. 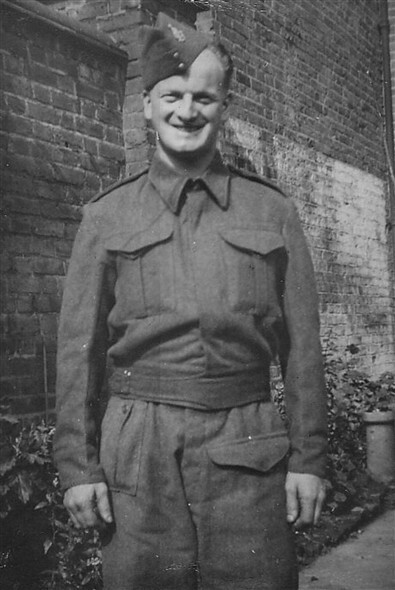 On leaving school at Easter 1960 I became an apprentice plumber with Oxley and Bennett Ltd. At that time, Southease railway station had three cottages, one detached for the station master and a pair of semi's for the signalmen. Each cottage had a hand pump at the kitchen sink to draw water from a well. I used to cycle out to these houses to repair the pumps when required, new leathers etc. 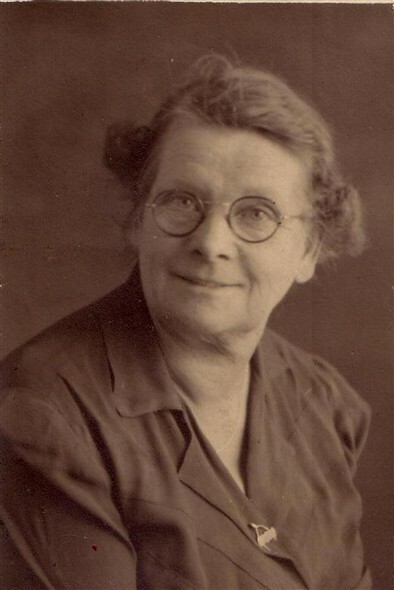 I still remember some of the occupants, one in particular, was an elderly white haired lady spinster called Rosie, her father was a signalman many years before. Rosie, had this pure white hair and would grow it to about sixteen inches in length, have it cut, then it would be used to make judicial wigs. Back to the subject of the water supply, I don't remember these cottages ever having a mains water service. Water was delivered by train in winter when the pipes to the well were frozen. These houses were very basic and came complete with an outside "Elsan" closet, just the thing for the winter. Keith Holder was my uncle, Ernie my grandfather and Roy my dad. I am doing my family history and Charles Barfoot, a cousin of my mother was headmaster of the school and living in the school house on the 1911 census. I would be interested in information on the school. Is the school house still standing? Hello, I am the daughter of Keith. I live in Kansas City, Missouri. He passed in January of 2008. Miss him dearly. It's so cool to read all of this about my family. Thank you, seriously. I'd love to hear more. Hello Scarlett, as I said above I went to school with Keith. He passed the 11-plus and went on to Lewes Grammer and I lost touch with him. I recall that for PE we used to have to sit crossed legged with arms folded on the floor and then get up with arms still folded, Keith used to struggle but he couldn't get up which is strange as he was very fit and a very good football player, or I should say soccer player. Later when I saw him at work he told me he thought he might go to America, this must have been late 60s or very early 70s. I never saw him again then his name came up here, its good to have contact with you. Regarding the school in South Heighton, my father George Holder said the Head Mistress was Mrs Stevens who lived in the School House and the teacher was Miss Cooper, he used to walk there every day from, Stock Cottages, the house behind the flint wall which has now gone, my dad is the youngest brother of the Holder family, we remember Keith well he used to visit my dad often, he taught him how to play football. I have finally found this site again, it means the world to hear of my dad. His love for soccer, or football haha, never ended. It's so great to hear stories of him! He became ill in 2003 and struggled until 2008. Miss him every day! Hi all, I’m just curious if the Holder family were carters did they ever live at stable cottages whilst at South Heighton? Also does anyone know anything about the head carter Vic Waite? Hello. Does anyone have info on Joseph Holder? 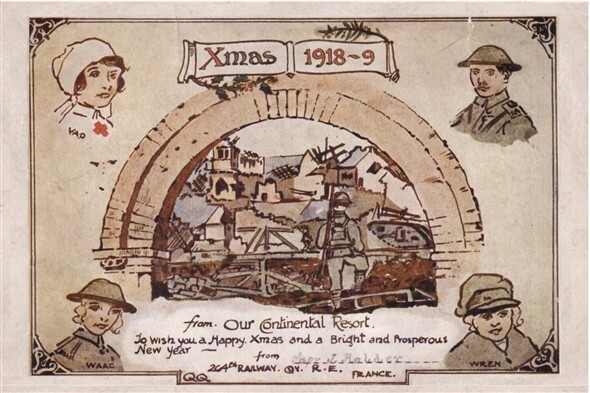 I see the postcard from 1918-1919 and wonder if this was my great grandfather Joseph Holder. I have been trying to find the rest of my family heritage. His parents names may have been William Holder and Laura Shelton or Sheldon. 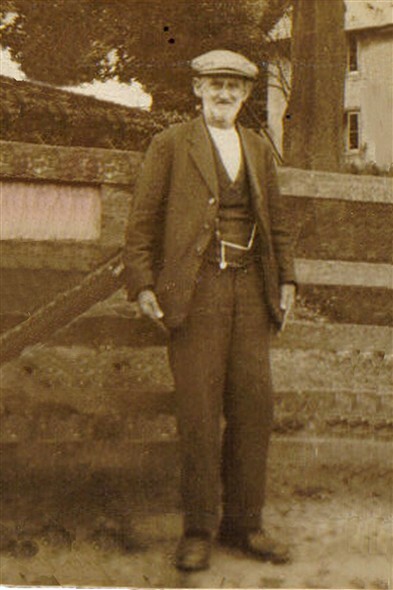 My great grandfather Joseph Holder was born in Newhaven, England in 1896 or 1897. He moved to New York in 1921 and married a woman there in 1930. He served two years in the U.S. air force in World War I. He was employed by Republic Light, Heat, and Power Company in New York, so I wonder if in Europe he worked on the railroad (If he was the one who sent the postcard). If anyone knows of him or of any of his family, please contact me. 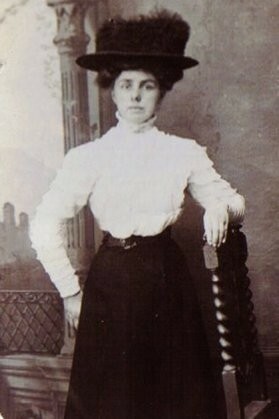 I’d love to know more of my family’s heritage. Just to add to your confusion there were two Joseph Holder's born in the Newhaven area around that time one birth registered in Dec 1895 the other 12 months later in the Dec 1896. If any can help Leslie we can forward her email address to you. Looking at George Holder's railway identity card, I thought he looks a lot like Keith. Can anyone else see the resemblance? 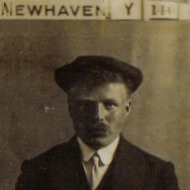 I'm sorry to say that Joseph Holder in my family never married and died in Newhaven in 1930. I can confirm that the Holder Family lived at Stock Cottages in Tarring Neville. There were 4 cottages in that location at the time. George Holder was a carter for Glynde Estates who owned all the fields in that area. He walked the line from Southease to Newhaven town Station checking the railway lines.